Celebrate Juneteeth with the Black Community in Cully! Come Celebrate Juneteenth weekend at an event by and for the Black Community in the Cully neighborhood! On Friday, June 15th from 4-7pm at Khunamokwst Park, let’s build community unity with a meet and greet, snacks, games and crafts (RSVP on Facebook here)! This event is organized by ShaToyia Bentley, Living Cully’s new organizer for the black community. This new position seeks to build a sense of belonging among black residents at Living Cully programming and in the Cully neighborhood generally. This Friday’s event will continue ShaToyia’s efforts to connect with the African America community in Cully. In addition to informal chatting, snacks and games, attendees will have the opportunity to draw what their community vision is for the African American residents in Cully, as well as share their ideas in a survey, including creating an official name for the group! Historically, African American and African Immigrant communities have not been largely represented in Living Cully programming. Living Cully came together with Taren Evans, Neighborhood Revitalization Manager at Habitat for Humanity Portland Metro/East, to address this oversight in Living Cully outreach. 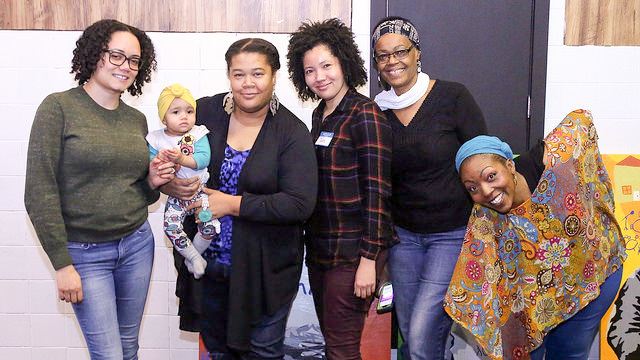 Taren and Living Cully successfully applied for a grant from Central Northeast Neighbors to fund the foundation of a black community-organizing program, covering the costs of three events and ShaToyia’s part-time position. “It’s a start,” said ShaToyia. ShaToyia, along with a committee of other African American community leaders in Cully, collectively hosted the first event back in March 2018: an African American Community Game Night. “I liked that me and my sibling got to come here with the rest of the community. We got to dance and play games and got to eat. I had fun! The people I met like Ms. Sunshine were very nice,” reflected Daisy, a youth who attended the event. For ShaToyia, this position is a great start for building a sense of belonging in Cully by establishing familiar faces and sparking conversation. Living Cully is committed towards working against displacement in the Cully neighborhood and beyond, and that work requires specific organizing with the black community. Displacement has hit the black community in Portland disproportionately hard due to a long history of racist red lining practices, City of Portland construction projects like I-5 and the proposed Emmanuel Hospital expansion, and other forces of investment and divestment in neighborhoods based on race and income. ShaToyia was born and raised in NE Portland. She went Beaumont Middle School alongside Cully youth and is expected to graduate Summer 2018 from Portland State University with a Bachelor’s of Science in Community Development. Growing up, ShaToyia spent time in Cully at her Uncle’s house. Back then, she said, her Uncle had black neighbors. Based on the 2010 US census, there are about 2,500 African American and African Immigrant residents in Cully. ShaToyia visions a more robust program in the future: a collective of people working to cater resources to the black community. Living Cully needs consistency in funding, leadership and events, she adds. Support ShaToyia’s efforts to build a sense of community among black neighbors in Cully by donating to Living Cully’s African American Community Organizing program here.